This Azores aqueduct is found on the way up to Sete Cidades from the south. 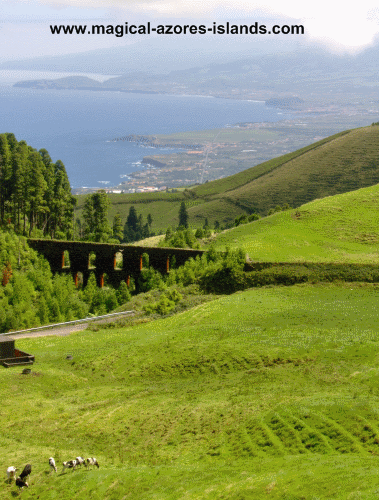 The view of the aqueduct and a good part of Sao Miguel gives a great idea of a typical Acorean landscape. There is lush green with the blue of the ocean everywhere you go. And of course there are a few cows in the foreground. If you haven't been to the Acores islands before, you should be informed that dairy farming is a major industry there. There are numerous farmers with small herds all across the islands. Another sight at the aqueduct that is typically Acorean is the abundant hydrangeas, they are huge and very attractive.